Researchers obtained a detailed understanding of how a master-type of inhibitory neuron in the brain called the chandelier cell is fed information that informs its regulation of a fear circuit leading to the amygdala. The brain’s astonishing complexity has been appreciated for over 100 years, when pioneers first looked at the profusion of branching structures that connect individual nerve cells under a microscope. They observed that even in the tiniest areas of brain tissue, the pathways are tangled, almost indescribably dense. Today, neuroscientists are trying to figure out the workings of all those cells and the networks they form, to better understand how the brain works and to understand what goes wrong in brain and behavioral disorders. 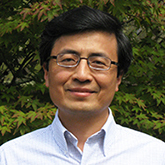 In a study appearing August 21, 2017 in Nature Neuroscience, a team, led by 2011 Distinguished Investigator Z. Josh Huang, Ph.D., of Cold Spring Harbor Laboratory, used advanced technologies to illuminate the connectivity pattern of chandelier cells, a distinctive kind of inhibitory cell type in the brains of mammals, including humans. The team revealed for the first time how this candelabra-shaped cell interacts with hundreds of excitatory cells in its neighborhood, receiving information from some, imparting information to others. The team, which also included Scientific Council Member Joshua Gordon, M.D., Ph.D., currently director of the National Institute of Mental Health and a 2003 and 2001 Foundation Young Investigator, as well as Jiangteng Lu, Ph.D., a 2012 Foundation Young Investigator at Cold Spring Harbor Laboratory, focused on dense crowds of excitatory cells called pyramidal neurons – several hundred of which can connect with a single chandelier cell. Because each chandelier cell can control the firing of hundreds of pyramidal neurons, it has been suggested that they exert a kind of “veto” power over local excitatory messages. But there is more to the story. As this research shows, each chandelier cell also can receive inputs from hundreds of excitatory cells, input that influences whether or not it inhibits a circuit in which it is involved. It has been suggested that malfunctions in chandelier cells, or networks that include them, may be involved in illnesses such as epilepsy and schizophrenia, in which the balance of excitation and inhibition of nerve signals can be abnormal. In the experiments just reported, the highly specific interactions between chandelier cells and groups of excitatory neurons were situated by the investigators in the context of a larger network regulating the fear response in mice. The new research reveals how spatially intermixed pyramidal neurons that were associated with single chandelier cells in the mouse prelimbic cortex segregated into two groups. These were distinguished according to where in the brain they project to and their likely function. One ensemble of these pyramidal cells was shown to transmit information to the amygdala, resulting in a fear response – or, depending on the context, the inhibition of fear. A second ensemble projects to cortical areas conveying information from the thalamus, a relay station that Huang speculates is sending higher-order information to the chandelier cell. This information might reflect, for example, whether the individual (whether mouse, person, or other mammal) should be afraid of something that it has sensed in its environment – or, no longer needs to be afraid.